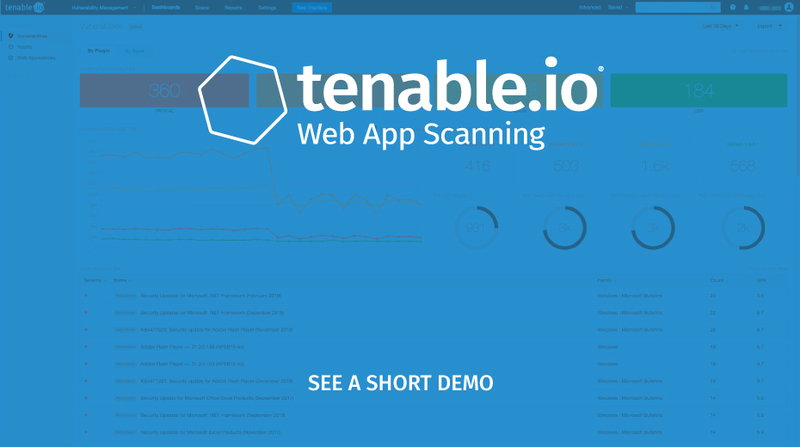 Tenable.io® Web Application Scanning safely, accurately and automatically scans your web applications, providing deep visibility into vulnerabilities and valuable context to prioritize remediation. Web application attacks are the top source of data breaches today. Outnumbered by developers and constrained by limited resources, you’re under pressure to secure your entire web application estate. You need to see all security issues and ensure your developers are remediating the highest priority vulnerabilities. Tenable.io Web Application Scanning delivers safe and automated vulnerability scanning that covers your entire web application portfolio. Through comprehensive and accurate web application scanning as part of a complete Cyber Exposure platform, you can see and manage your cyber risk across all types of assets and fully protect your organization. Scan your HTML5 and single page web applications, along with traditional HTML apps. Gain broad web application coverage so you can avoid blind spots. Minimize the number of false positives and negatives to give you confidence your reports are accurate and won’t waste developer’s time. Eliminate gaps and inconsistencies that come with managing multiple, siloed solutions. See and manage all your vulnerabilities in one place so you can fully protect your organization. Take advantage of the first Cyber Exposure solution to cover any asset on any platform. Understand your security risk without the manual effort and time otherwise needed with penetration testing. Deliver highly accurate, actionable scan results with minimal false positives and negatives to improve developer productivity. Understand your Cyber Exposure across all types of assets, without adding another point product.